https://justworldbooks.com/praise-gaz...From SAMAH SABAWIPalestinian commentator, author, poet and playwright originally from Gaza:Gaza Writes Back is a confronting, bold and intriguing book that takes us up close and personal into the minds of a young articulate Palestinian generation born stateless, under occupation and growing into adulthood under siege in one of the world’s most oppressed and dangerous environments.This is a generation that is physically confined within Israel’s walls and emotionally scarred by Israel’s relentless bombings and incursions. Though the stories are Palestinian, Israel’s presence is felt on every page. In fact, a few writers have even tried to enter the minds of Israeli soldiers by creating Israeli characters and trying to imagine how they think and how deeply they may regret their actions. It is as if reducing the IDF to human size, imagining them capable of fear, lament and guilt helps the writers overcome their own fear of the "other." This book also expresses anger at the uncertainty of life while the writers continue to cling to faith and hope. But make no mistake about it, unlike other works that romanticize Palestinian steadfastness or "summud," this book intimately reveals a simple truth; steadfastness is not a deliberate choice or a romantic defiant act of resistance, it is simply a human instinct to survive. The overwhelming voices of "Gaza Writes Back" young female writers and their refined eloquence and capacity to express dissent not only challenges our stereotypical perception of Palestinians and women in Gaza in particular, but it also challenges the norms within Palestinian society itself. One can’t help but contrast this with the lack of young female presence in Palestinian official political circles.This book is a promise of a change in societal norms and a positive sign of what is to come. Despite the horror, the frustration, the physical and emotional scars, the voices in Gaza Writes Back have not given up on their ambitions and have not resigned their dreams for a better future. The stories mentioned in this Gazan Book hold immense deals of feeling of black sadness of distress days the people of Gaza (me one of them) passed through years ago. Each December the people recall the pain again as it just happened. These humankind experiences need to be told to the whole world, because we know how much this express peace. My heartfelt thanks goes to Dr. Refat, and to those who articulate the pain in kind words. What an amazing project to help Gaza kids cope with their abnormal lives under a brutal military occupation. Wow. Why can't I write like that? 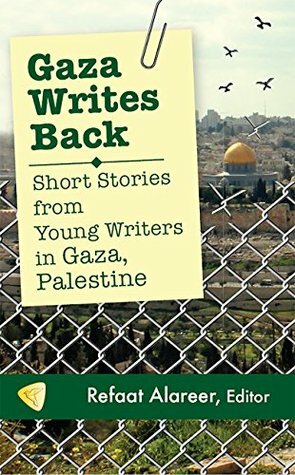 An anthology of short stories all written by young Gazans, Gaza Writes Back is diverse in its subjects, from the story of a freedom fighter ambushed to the story of a mother whose son died in prison, while all written on one particular subject; what it's like to live in modern-day Gaza. All these stories were specifically designed to hit an emotion, and all of them succeeded. "I didn't even know if my eyes were open." So begins 'From Beneath' by Rawan Yaghi, my favorite story; it is a the first person narrative of a child trapped underneath the rubble of their home, waiting to be rescued. Yes, it's as powerful as it sounds. But hidden underneath is an even better metaphor; the story of the child is much like that of Palestine. Buried under the rubble of the Israeli occupation, they are bleeding out, waiting, hoping that someone will come and help them out while the world turns a blind eye. Very well written, thoughtful and heart-breaking (or warming, depending on the story), I would highly recommend this to anyone who would like to know what it's like to live under the occupation, or just wants to know what it's like to be Palestinian in general, or to anyone who likes a good read. a selected series of short stories written by the youth of Gaza .. different stories different pain but the common thing about these youth writers is Hope holding on hope generating hope for daily survival .... I was thinking to myself as a young Libyan and other young libyans how would our version of stories would be ... with the collapse of the country and hoping for a better chance of a successful well established state with all the struggles we are facing ... even though the circumstances and conditions are 180 degrees different from the youth of Gaza but what is common is Hope in gaza in libya in the whole region of the Middle East. Great collection of short stories. These are not stories that are commonly told in the media and are written by youth who paint a clear, tragic but human picture of life in Gaza. Some are tragic, some witty. Well worth a read for a different perspective. "El palestino como una víctima indefensa, un simple objeto de simpatía; o como un salvaje sediento de sangre. Los palestinos no son ninguna de las dos". How would you feel when a building crashes and you are left under the rubble? Your house taken away? Your best friend dies in front of your eyes.